The majority of people who enter into a romantic relationship do so in the hope of finding lasting love with another human being. They have a mutual respect for one another, empathy, emotional attachment and all the other feelings that go hand in hand with a healthy, normal relationship. A relationship with a narcissist is anything but normal. Their emotional maturity has not developed in the normal way and as a result they become emotionally stunted adults unable to sustain a long lasting mutually loving and respectful bond with another person. ‘I have to warn you. Before we start, you should run. Don’t look back. Forget you ever met me. I will break your heart. I will not regret. I will fall fast and hard for you. I will love you to the point of exhaustion. I will make your family and friends love me. I will give you hope for a perfect future. I will speak of marriage and kids. I will get bored. I will lose all interest in you touch, your word, your life. I will pull away without explanation. You will try to remind me of the good days. I have already moved on. You will defend me to your family and friends. I will pretend I have never met them. I will not stop until you hate me more than you ever loved me. You think you can fix me. You are wrong. 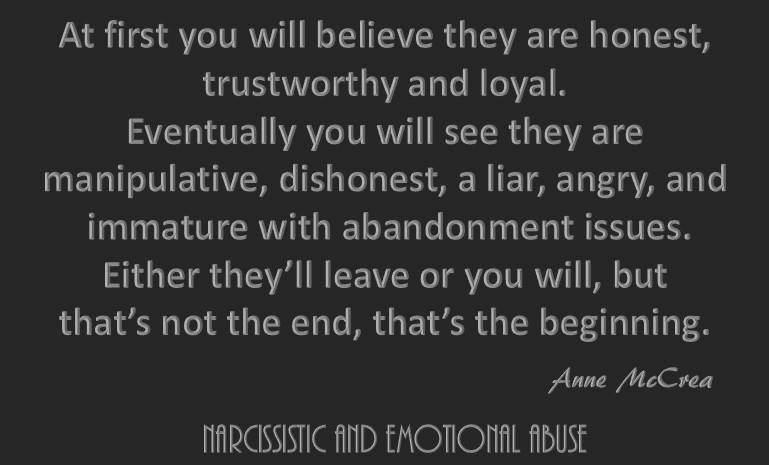 During the initial stages the narcissist will be on their best behaviour. They have a great ability to appear charming and charismatic. They’ll shower you with love and attention and have you believing that you have met your soulmate. They give you the impression that they are everything you ever imagined in the ‘perfect partner.’ They are quick learners and by listening and watching you closely, they will pretend to be that person you’ve been looking for all your life. They have the same values, standards and principles. How could you have been so lucky to have found someone who mirrors you and all your hopes and dreams? The narcissist needs people in their life more than any other. They need what is known as narcissistic supply. They need your attention and your admiration just as a plant needs water. Without it, they wilt. They are unable to form a bond with anyone but are experts at manipulating you into bonding with them. Nothing about this idealisation phase is real. It’s all a sham. The person who you think they are is really an accomplished liar and actor. This stage may last for weeks, months or maybe even a year, but it is an illusion. This relationship WILL move on to the next stage and you’ll be left reeling, wondering what on earth just happened. A narcissist’s attention span is rather limited. Once the narcissist believes they’ve got you where they want you, they get bored. This is the phase when you will see the real person, the empty shell of a human being that is the narcissist. They come to despise their own dependence on you, their supply and so their devaluation will begin. They’ve learned a lot about you in Act I and they will use every piece of that information, embellish it with lies and use it to discredit your reputation in an effort to destroy you. You may see the narcissist pull away from you and become emotionally distant, cold and uncaring. You may find you are being constantly criticised, from your appearance to the way you walk, and no matter what you do, it will never be right. Your feelings of self worth are slipping fast so you will tolerate more and more of their deteriorating behaviour. Confused and alone, you’ll try harder to please the narcissist. Why do you stay? You stay because you’re still holding on to the memories of who they were before, and you desperately hope for a return to those good old days. The narcissist is a master of manipulation. They will let you see glimpses of that person they were before just to keep you in their clutches. This particular form of intermittent reinforcement and then punishment develops into the most powerful of emotional bonds and attachments. Although at this stage, you are providing your abuser with endless narcissistic supply, they don’t like the weak individual you seem to have become, (never accepting responsibility that it was their sadistic mind games that made you this way). By this time your self worth is somewhere in the gutter, you may have been isolated from everyone you once held dear because somehow the narcissist managed to convince you they were no good for you. Close friendships are long gone because the narcissist created friction where once, there was none. They have succeeded in bringing your self esteem down the level of their own. It is at this time they need a boost, they need their ego stroked with fresh supply. You are no longer useful. They often vanish from your life without warning, initiate one of their infamous silent treatments, no goodbyes, no closure, nothing, zero, zilch. This type of behaviour is known as ‘Ghosting.’ Your emotional needs are of no interest to your abuser. In their mind, you no longer exist… game over. When that final curtain falls, you will be crushed to your very core, even if you were the one to call time. Nothing you could have done could have changed things. This relationship was doomed from the outset. Nothing you could have done could have altered the outcome. Nothing can alter their dysfunction. Making some sort of sense of their dysfunction is not something that normal human beings can fathom. This is the way the story ends each and every time. But because I finally learned to love myself. But in your world no one ever is. I left my husband for a narcissist because I though he was my soul mate now nine years on I have just found out he is a narcissist in all those years I thought it was my fault for all he was putting me through,untill I read about narcissists by chance im not a young person im 71 and I should of known from the start looking back,im still rearing from the shock because now I know that their is no hope of a loving relationship,before I thought well if I am different with him maybe their is a chance ,all that has gone and he is worse than ever. (He is 10 years younger than I am) I really do not know what to do this impossible living hell at my age,I shake my head because I cannot believe such a person lives.But their is one thing I cannot understand he was in a marriage for 25 years until she died 16 years ago,he speaks of her as being perfect no one comes near how wonderful she was puts her on a pedestal no one is better than she or ever will be,did she learn to keep on his good side and never criticize.he showered her with gifts as he tells me.My family don’t want to come and visit when hes in im afraid.I am at the end of my tether emotionally with nowhere else to go quickly please advice.many thanks. Ms. King, I am so sorry you are in the situation you are with this man. I just wanted to give you a little bit of clarity about his deceased wife…HE IS USING HER AS A WEAPON. In reality he abused, used, and disregarded her just as he does you and her death, for her, was probably a sweet release and freedom. Since she is no longer around she cannot tell you these things and he can compare you to his “perfect” wife to keep your self esteem low and to continue to break down your self esteem. Narcs use comparisons as psychological weapons in their abuse. Please, PLEASE do not believe him…you know he is a liar. You are valuable, you are useful, you have a purpose on this earth, and you can live knowing that! Please seek help. Find someone who will advocate for you and try to remove yourself from this situation. These are to be your golden years…don’t let him destroy them. Mine would say the same about his ex..I felt everything u felt so one day I contacted her and it turns out their relationship was worse than mine and she hated him!! She was massively emotionally abused and at times physical..I always thought their relationship was perfect from the way he made it sound..it’s all fake! He’s using his deceased wife so you can feel you will never live up to her but will keep trying to do you can be under his control and please him..
Kathleen, please don’t be hard on yourself. 8 years ago, while going through a divorce, I met a man who I thought was my soulmate. 25 years of marriage I tossed out the window as this man seemed to offer everything. I look back and feel so stupid. It is the classic story of narcissism and the hardest part is feeling that at 60 years old I should have known better, or at least accepted the mistake earlier. It was 8 years of manipulation and abuse looking back. A big blow to my sense of myself. I believe there are lessons to learn at any stage in life. I believe they chose us for all the good qualities we possess. You have a clean slate and the opportunity to give to yourself instead of wasting it …. to take charge of your own life. I understand your desire to find someone as I feel the same way. But…. I am working hard on accepting all the good I do have and mostly peace for myself. I hope this helps. It is so hard! Oh my God! I am in a relationship with a man with NPD. Everything I just read is him to a tee! I am scared and I dont know what to do. He belittles me all the time. He has alienated me from all my friends. He always puts me down and has me believing I am nothing. He is very emotionally and mentally abusive. Any time I have tried to get out of the relationship, he threatens to ruin my life! Please help. He is an addict as well and has several addictions. Dear Scared to say, get out of that relationship asap. It will not get better, ever. Get your stuff and go NO CONTACT – this is very important! Block his telephone number, fb page, twitter… Seek a restraining order if you feel the threats are serious. Also very important: DOCUMENT the threats! All messages, voice mails, etc. Make a copy of them all so you can have a proof. Do not react emotionally or with anger to his provocations, do not react at all. Be a gray stone, Going no contact is the only way to stop the abuse, the more time passes without any contact, the faster you will heal. Be prepared to go through a tough time, but know that it will pass and you will heal. Don’t believe anything he says and don’t get hoovered by his false tenderness and care. Keep in mind that the only thing you have to take care now is you. Good luck. Best of luck, you will make the right decision, as hard as it will be!! Kathleen, I’m sorry you are going through this. Narcissists love to triangulate & this is what he is doing with his deceased wife & you. He wants to hurt you & make you jealous. He has rewritten their history to make her & their relationship sound perfect….& to torture you because how can you possibly compete with that?? Trust me, she went through the same horrible stages that you have with him, she just happened to have died so she gets the luxury of being the only person EVER to remain on the pedestal with a narcissist!! As far as showering her with gifts, who knows? He likely did during the love bombing stage, but narcissists are also LIARS, so he could just be making it up to make himself sound wonderful & to make you wonder what is wrong with YOU to not have him shower you with gifts. Please keep reading all you can about this disorder & try therapy to help you wrap your mind around it all. I pray you can find some peace in your life & realize this is not you, but him. You deserve to live a happy, peaceful life free of this horrid abuse! Oh, Kathleen my heart breaks for you. The only and best advice everyone in these situations will receive is that you need to get away. If you were to reach out to your children, would they safely take you in and protect you so that you can get your life back? I have been through this cycle thousands of times with my ex. The addiction to him is hard to break. But by reading as much as possible on this pathology has helped me gain strength through understanding this pathology. There is tons of support out there on the web. I’m glad you found this site to help. I urge you to KEEP READING!!! It’s invaluable to your healing. 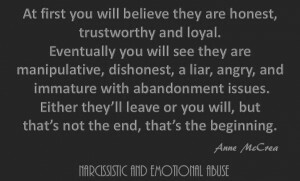 I am just out of a relationship with a narcissist after 24 years of mental abuse lies and addiction. He was my life but I let him control every aspect of my life. My career, friends, finances everything. He was manipulative and had been unfaithful to me for god knows how long. But now I do not care and in time you will stop also. Read as much as you can about this abuse. It will give you so much strength and make you understand that the relationship you have been in is not normal. But you are. You have a heart a concience and it has been damaged. But you will heal. Being with a Cluster B person is the most horrible thing that can happen to a person. And the only thing that is worse is not having people around you who understand what u are struggling with internally . I will never date again after my experience with my abuser Matija Turkalj . I will never be the same after something so awful. I was with my ex military narc for three years. He emotionally and financially abused me. He controlled every aspect of my life. He discarded me on to many occassions to recall but somehow always sucked me back in. I thought he was suffering from PTSD after a overseas deployment and excused his behavior for this reason. I wanted to be the ” supporting wife” we were not even married three months before the final discard. He did smear campaigns to friends and family accusing me of ” beating him” and my children. Thankfully i came across NPD and it opened my eyes to condition. Everything i had been living was right there on the computer screen. It gave me answers but no closure to my nightmare. I made the best decission to go no contact 1 year ago. Family have supported me with this so he can maintain regular contact with his son with out me breaking the no contact rule. Dispite him trying to control me through the courts i have maintained the no contact rule, focus on my children and my new career goals. It isnt easy to forget but it is possible to move on. You must rise above, focus on you and your family. Build your self-esteem and confidence back. And remain the grey rock to the narc !!!!! I too was in a relationship (Marriage),with a 50+year old.Who I now know to be a narcissist…At the beginning I was treated like a queen,with my money. …We went & did everything that he wanted to do,including moving to Queensland…When we first left our home state I couldn’t believe that he never wanted to say goodbye to his Adult kids & Grandies. He always had a need to be going different places,doing things….His 1st Wife left him for another relationship as I was a family friend already he latched on to me pretty quick,I would assume he would have known my financial status due to being a Family friend..At the time I couldn’t believe after 30 odd years of Marriage he seemed to be able to accept the ending and to start a new relationship as quick as he did….He proposed Marriage very quickly?? When HE decided he didn’t want to be married anymore he alerted our/my friends and moved back to his home state….I have never chosen or had the need or want to see him again,on the final day that we were together I had a realisation that he was a Narcissist not someone suffering with BiPolar…I do not wish him any harm but hope to god that he never remarries….A late memory,one day we were driving to a Melbourne hospital for me to have major surgery,on the way down he told me that he wished I never going to come thru the surgery…I was never allowed to ridicule or re visit any of those times….All thru out our relationship he spoke about a brother adversely to me,it appeared that he had no time for him as he used to pick on him as a kid,we did get to visit him on one occasion,everything seemed ok on the surface,but now believe jealousy may have been an issue…I personally found both Brothers to be good people….Being a social person myself & him being anti social many of my long term friends & Family didn’t understand why we were together…Being Married to a narcissist will never be a happy relationship….in my opinion and experience anyway….. Knowledge is so good. Sadly I recognize far too many now after being married to Nw. Sad that there are so many. Happy that I now see them early. I have also learned that 99 % of family and friends are so convinced of the lie that I am the Abuser. “The Abuse” was, in reality , my persistent requests for her behaviour to be different. Of family and friends, 99% are Enablers , and a few of them are Ns also. The police and the Magistrate are also Enablers. They are decieved by the performance. Someone should nominate her for one of those Hollywood Leading Actress Awards (whatever they are called). Be in no doubt: She is that good at acting. I believe that is because at one level, she believes the lies herself. There is a strong sense of entitlement and of being the victim. There is also a large lack of empathy towards me but seemingly high empathy to others. I am reminded of 2 occasions when my request for her to phone an ambulance were declined. I was highly stressed for years, so the consequent health issues were numerous. The more unwell I became, the more angry and abusive she became. My fatigue was interpreted as laziness. Since no contact 1 year ago, my health has improved dramatically. I used to not comprehend how we could be having a conversation (which Nw would call an argument because I was seeking to address the behaviour) in which I would be clearly distressed at the stonewalling. Then her phone would ring and within 2 seconds she would be laughing on the phone with her friend. That change was instant and in my mind was beyond comprehension. Those conversations never resulted in any change whatsoever. When I asked for something it was always declined. For example: I asked that she not answer the phone when we were talking together. Not once did she leave a call unanswered when we were talking together. And similarly, I would frequently receive the silent treatment and she would ignore my calls to her. If I am in the midst of a d and m conversation with anyone, especially my significant other, I would not answer the phone, which can easily forward to voice mail and later I can respond to the caller. Those conversations were clearly counterproductive because my requests were noted so that she would then do the exact opposite, repeatedly. This is not the way to be treated by someone whom I was committed to and whom I loved. As for the Enablers that I have mentioned: I am gobsmacked that not one of them is willing to say to her : “Can we have a conversation, because what is going on here is not right? “. This includes my Pastors. Looking forward to 2017 because I am now free by No Contact. Many people comment about how similar their behaviours are to other Ns. This aspect was one of the keys to me understanding what the reality is. I would tell my sister what NW was saying and doing and it was identical to what her NPartner was saying and doing. Sometimes the words they use are identical. Thankyou Anne for your excellent writing. Once again it is always so similar to my experience. The last paragraph describing the ending was exceptionally powerful. I have written another comment beside this one which I hope helps other survivors. May they know that their experience is not unique as they at first Knowledge is so good. Sadly I recognize far too many now after being married to Nw. Sad that there are so many. Happy that I now see them early. Many people comment about how similar their behaviours are to other Ns. This aspect was one of the keys to me understanding what the reality is. I would tell my sister what NW was saying and doing and it was identical to what her NPartner was saying and doing. Sometimes the words they use are identical. Learning that there are many others in the same situation is enlightening and actually aids in recovery. The smear campaign will sting, yes.. But in the long runyou know its all lies, so you shrug and reply. “Its a symptom of his cluster b” and move on with your new life. Plan, prepare, and move, divorce him, and move on. Im two yrs into his smear, and people are finally getting it, about him– folks tell me what hes ssyin’ about me and i smile and say, bless his heart, his cluster b disorder is still showing. –one by one they pick up their smartphone and google it… viola-!! Folks no longer believe him. This resonates so much with me – it is as though there is an epidemic of Narcissism throughout the world……..I ask myself , at aged 65 and widowed after 34 years of marriage, how could I have been so naive, so trusting, so foolish as to believe I could have met a man with all the qualities that appealed to me – that I believed in – that I took at face value the early protestations of love and commitment…..Sympathising at his “bad luck” at having had two bad marriages with “horrible” women who abused his kindness and generosity. I believed all that……but the devalue came very quickly in the relationship….He asked me to marry him (twice) and I agreed – thrilled that I had found a love and a companion to travel the rest of our lives together – horrible mistake……..there were the red flags and I felt anxious and uncertain at his behaviours – the discard was brutal and the savagery was soul destroying……..so at age 70 I am once again single and intend to remain that way – there is not peace – only sadness – but that is better than the alternative…..the fear…. So sad to experience such brutal treatment. I spent 12 years trying to please a man that would only find ways to hurt me. He called me at work one day and told me he never wanted to see me again. 6 weeks later he slept with someone he was communicating with for years. We could not salvage any type of relationship. He lies to me every time I speak to him. He has decided to move to Los Angeles to live with his newly divorced girlfriend. She has been in an open marriage for 10 years. He has made friends with her husband and plans to move into their apartment. I still feel sad over what’s happened and try to put all of this behind me. It’s been the most difficult battle of my life.